See below for configuration options. *Available in 5 standard and 9 custom colors. Standard wall mount, monitor tilt, Flip-up keyboard tray. Standard wall mount, monitor tilt, WorkSurface keyboard tray. VT21 with low profile monitor mount, no monitor tilt, Flip-up keyboard tray. VT21 with low profile monitor mount, no monitor tilt, WorkSurface keyboard tray. VT21 on extended arms, monitor tilt, Flip-up keyboard tray. Track and track adapters sold separately. VT21 on extended arms, monitor tilt, WorkSurface keyboard tray. 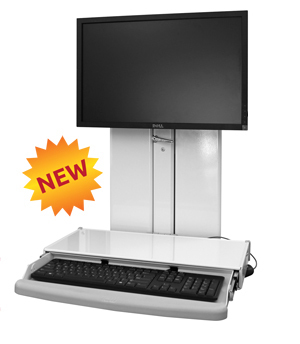 The VTLP is an excellent choice for areas that require a low profile workstation such as hospital corridors. The stowed depth can help maintain adequate hallway space to comply with fire codes. This model provides 180° of horizontal swivel at the wall mount. Ideal for patient rooms, the VT21 Tandem Arm swivels 180° from the wall, enabling caregivers to rotate the unit to share information with patients and family members. The VT21 mounts flat against the wall and has an extended depth of 17″ (43 cm). With a monitor and keyboard its stowed depth is 5.5″ (14 cm). The monitor rotates, swivels and tilts for ergonomic viewing. All VT21 models raise and lower 21″ (53.3 cm) with smooth, easy movement. They have locking lift assist which secures the units at any point in the range of motion. These mounts are comfortable and ergonomic workstations. The VT21 workstation has internal cable management that creates a neater appearance, protects wires and simplifies cleaning. Machined from strong billet aluminum, the unit is powder coated for a durable, lasting finish. ICW mounts are designed, engineered, manufactured and hand-assembled with complete attention to detail. The VT-21 will provide years of dependable service. The VT21 workstation stows very compactly. The unit supports up to 25 lbs (11.3 kg). The workstation provides true Sit-Stand capability. The VT21 Tandem Arm swivels 180° from the wall mount. Internal cable management protects wires from damage and simplifies cleaning. The VT21 workstation is machined out of billet aluminum for strength and durability. Available in 14 popular powder coated finishes to match your décor.